The match is a multi-step process. It begins with the wrestlers entering the stadium and sitting across from each other, beginning the psychological battle. 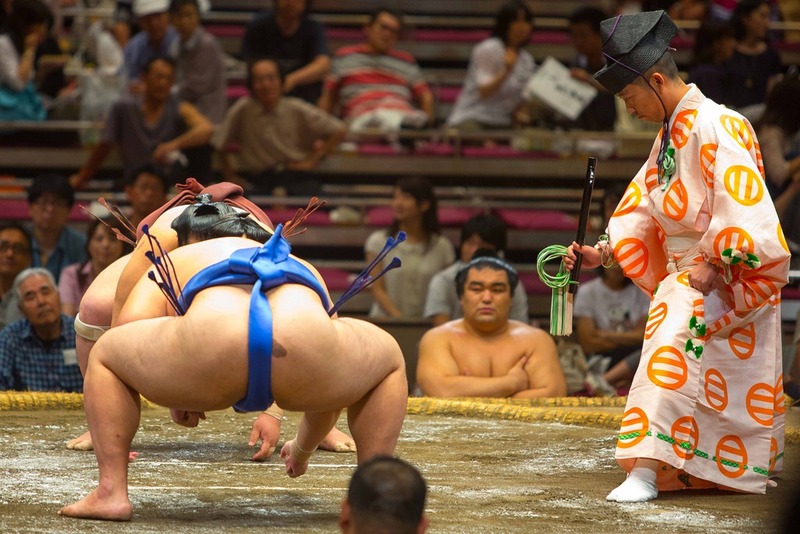 When the preceding match ends, both wrestlers rise and move toward the ring to begin a series of purification rituals. The yobidashi (announcer) will signify the start of the next match by signing out the names of the two wrestlers. 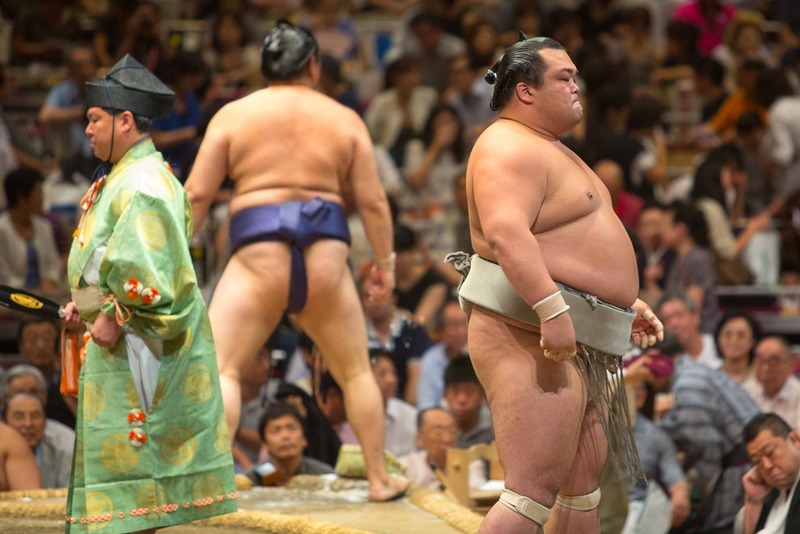 They rise, and step up onto the dohyo. While facing each other, they look straight into the eyes, lean, and then turn towards their “corner”, located respectively at south-east and south-west. 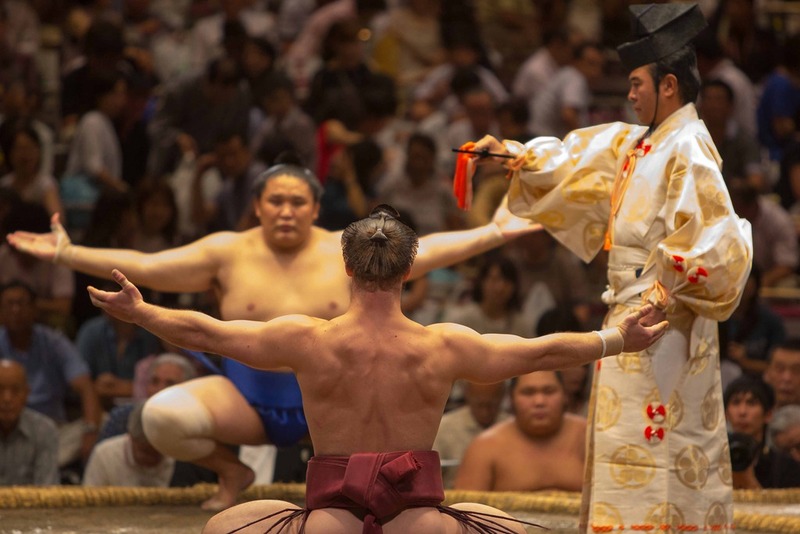 The first move, performed simultaneously by the both wrestlers, is the shiko. 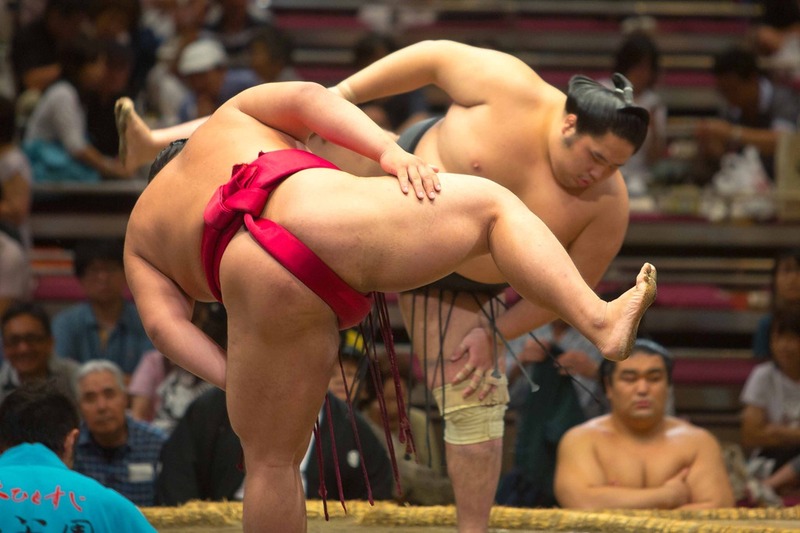 With the feet exactly at the rope edge (tawara) that marks the border of the sacred circle, and turning their backs to the center of the dohyo, they squat, clap their hands, raise their right leg as high as possible, and stomp it back on the ground loudly, then proceed to do the same routine with their left leg. Then they rise, step over the tawara, and squat down again in their corner. There, they receive the chikara-mizu, a ladleful of the “strength water” with which they rinse their mouth, and also the chikara-gami, a piece of paper they use to wipe their lips afterwards. 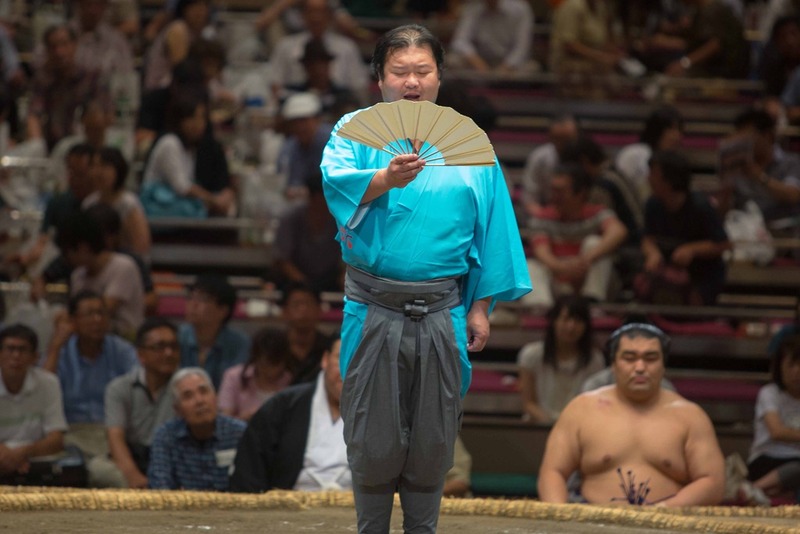 During this time, it is the gyoji’s (referee) turn to announce the names of the two wrestlers, in a very high-pitched and specially trained voice. 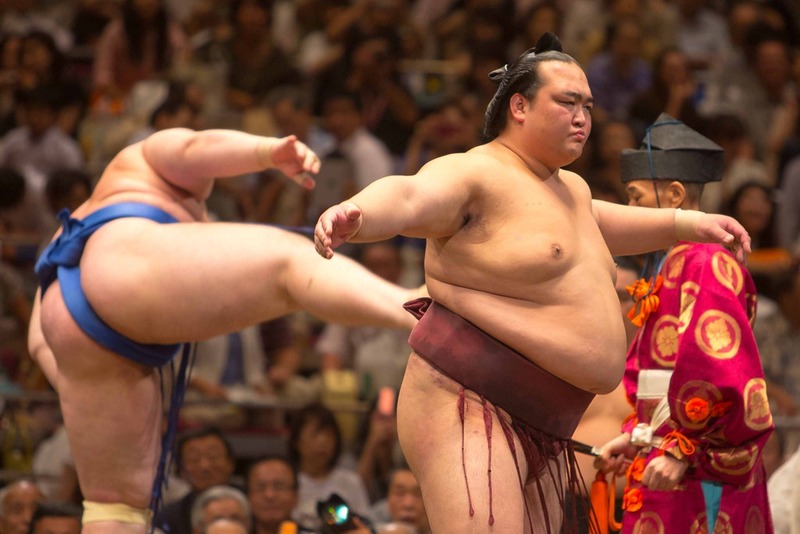 Once their purification is done, the two rikishi direct themselves simultaneously to the side of the circle where they entered, straight east or straight west. Again, they squat down facing each other, knees wide (this position is called ‘sonkyo‘). They clap their hands powerfully once, and then raise their arms to a horizontal position, to show their opponent that they are not hiding any weapons and that they wish to meet in a fair fight. They then rise, and return once again to their own corner. It is at this moment that the kensho are presented. These banners symbolize the prize money, placed on the bout by the sponsors, that will be given to the winner of the bout. 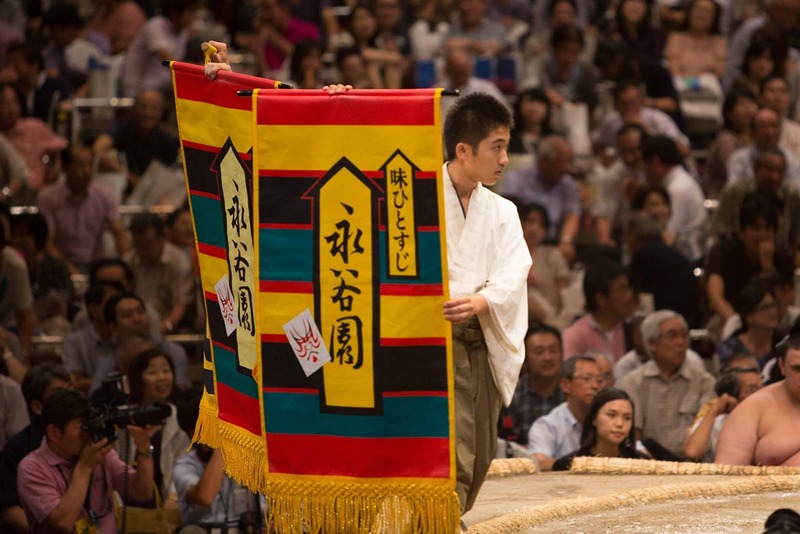 One banner represents each sum of money, and they are displayed and carried around the dohyo by the yobidashi. 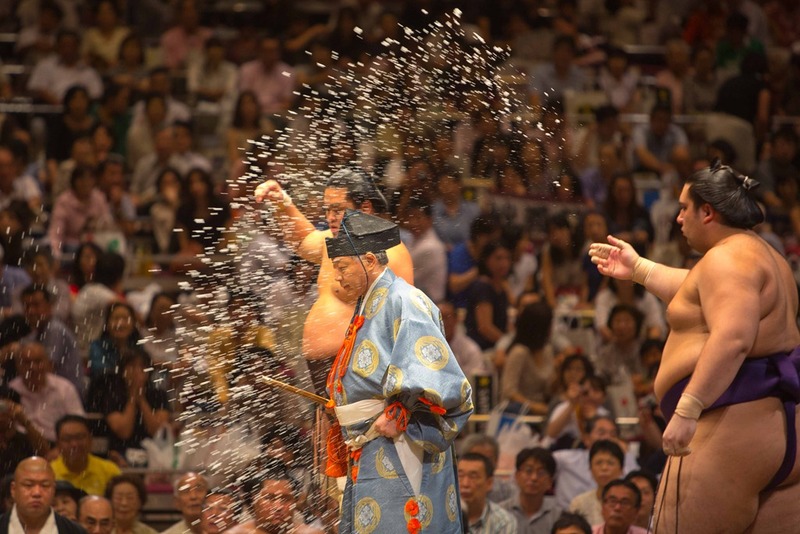 Not waiting for the yobidashi to descend from the dohyo with their banners, the rikishi grab a fistful of salt from a container placed in their attributed corner, and throw it on the dohyo as they re-enter it again simultaneously. This salt is meant to purify the arena upon which the battle will take place, and to drive away any malicious spirits. The wrestlers now place themselves at the center of the dohyo, exactly behind the shikiri-sen, these “starting lines” drawn on the ground. 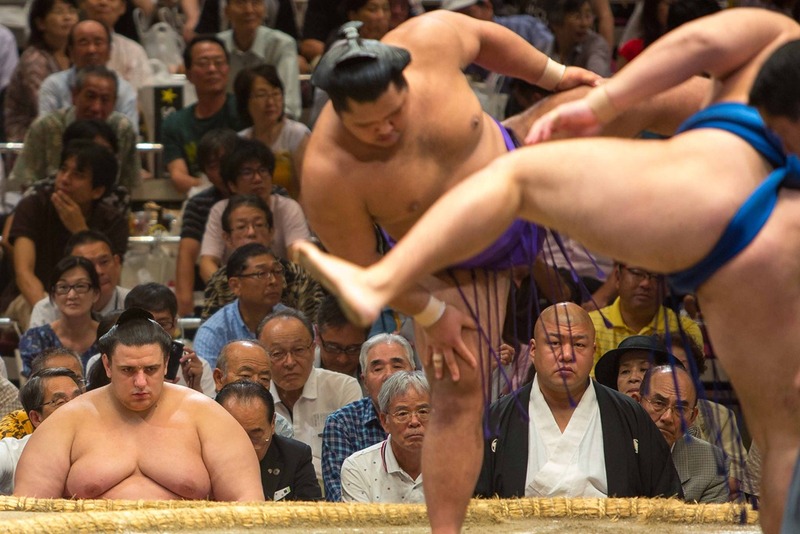 Separated by only centimeters, the wrestlers stare again deep into each other’s eyes, and perform another shiko: clapping their hands, lifting up their right leg, and then their left. They rise, step back one or two steps to reach their desired starting position, then they crouch down yet again, their backs straight, before rising and assuming the shikiri position: knees spread, body leaning to the front, fists placed on the ground. 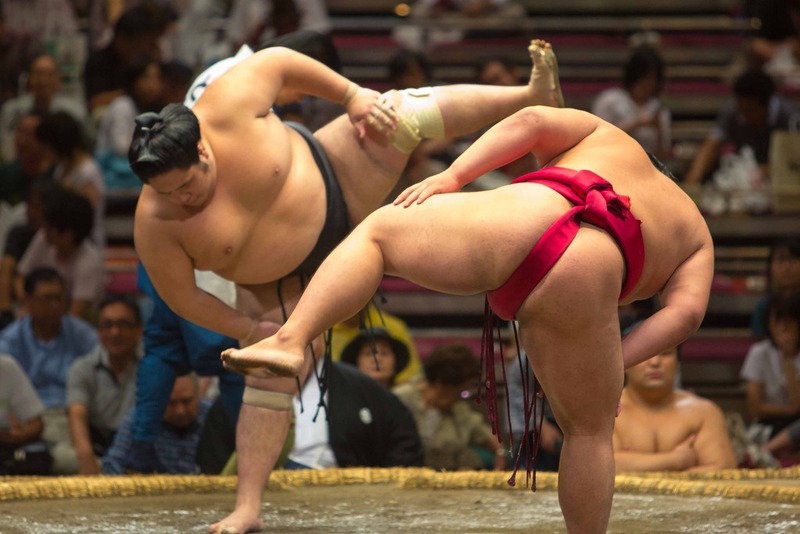 They repeat all this twice more: they return to their corner, take a drink, wipe their body, grab and throw the salt, return to the center of the dohyo and assume the shikiri position. The wrestlers make a great show during these steps to “psych” each other out. In the junior matches they are not allowed to take these steps and years ago there was no time limit so they could go into the start position and stop infinitum. With each return to the side of the ring the crowd gets louder and louder. 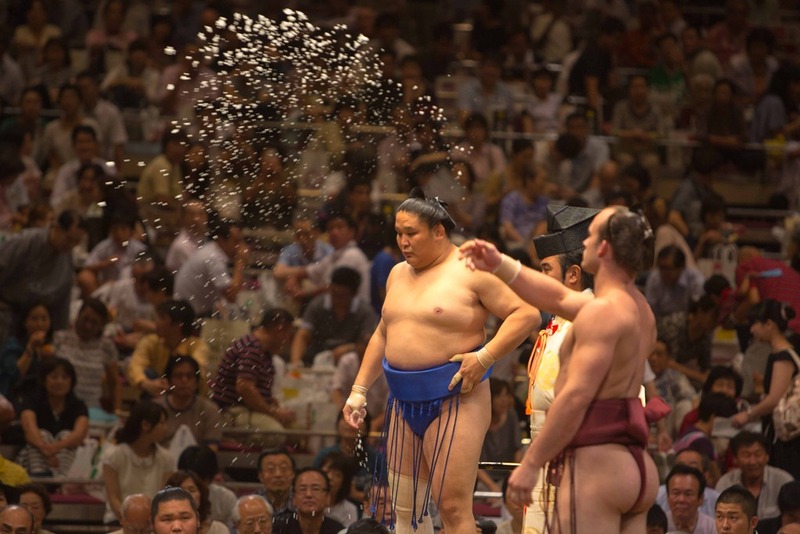 On a number of occasions the wrestler would grab an abnormally large handful of salt which would work the crowd into a frenzy. 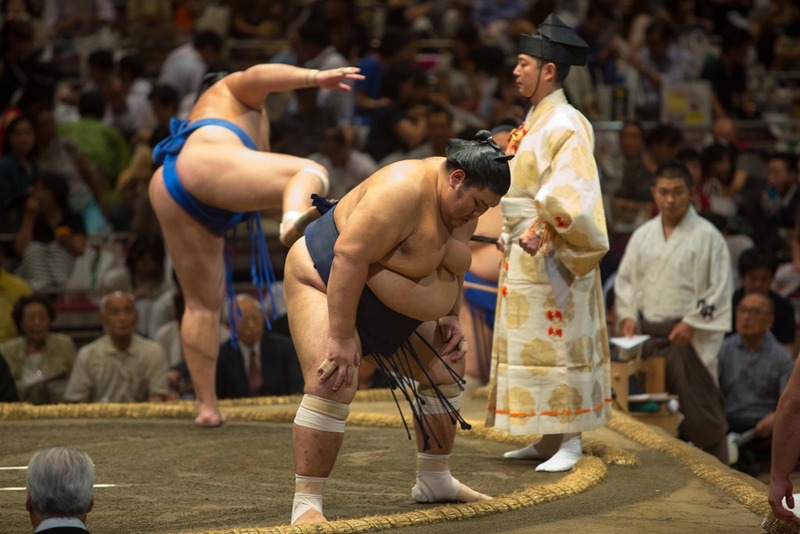 After they have returned into the circle for the third time, the gyoji informs them that the time limit allocated for the preparation has been reached, and that they should now finally start the bout. 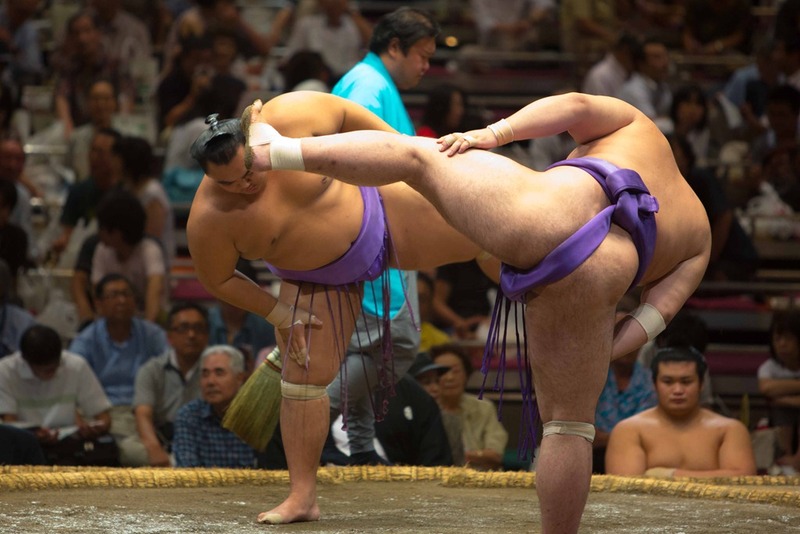 This entry was posted in Our Asia Adventure and tagged Japan, pre-bout, preparation, Ryogoku Kokugikan, Sumo, sumo match steps, Tokyo by michaelweening. Bookmark the permalink. LOL. Ajia, I have to admit I did not look as closely as you must have. Well done! Congrats on the A and glad to help! Hi Michael. Could you give comments on the ritual after they win. Seems like the winner gives a drink to another.. etc whats the meaning?